NEWINGTON - The town inches ever closer towards securing a train station and development on Cedar Street. 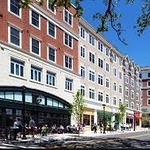 Elected officials are still mulling over Town Manager Tanya Lane’s vision for a Transit Village Design District, featuring shops, restaurants, entertainment and housing, to complement and encourage use of a future Hartford Line train station proposed by the Department of Transportation at 565 Cedar Street. Both the train stop and the village are still in the visionary stage at this point in time; their feasibility has yet to be determined. The Town Plan & Zoning and Inland Wetlands commissions must sign off on the land use potential, after just denying a housing project at 550 Cedar St. due to traffic and safety concerns in that same area. Located directly west of Old Farm Drive and Maple Hill Avenue, the site would include about 20 acres north and 43 acres south of Route 175. This zone currently houses several manufacturing companies, a gas station, a bar and a Dunkin’. Lane said she has notified the property owners of this future land use proposal. “They are aware it’s still in its infancy,” she said. The regulations would dictate the nature of any new infrastructure, from buildings and roads to permitted uses, landscaping and design elements. Ten percent of rental housing would be offered to families earning 60 percent of Newington’s median income ($80,000), which equates to about $48,000 per household. This would help the town adhere to state mandate 8-30g, which requires municipalities to provide a certain amount of affordable housing within their borders. Several councilors weren’t comfortable moving forward with the idea until others have considered it. “I don’t feel comfortable putting my name on a plan I don’t have enough information about,” Deputy Mayor Beth DelBuono said. “Rushing to adopt a zoning change based on things we see in other towns assuming we can do that here is a little shortsighted,” Budrejko added. Majority Leader Carol Anest said drafting regulations for the zone would not cause any harm. “It’s going to be months before these plans are completed. We have to be proactive on this,” she said. Anest envisions the village becoming a destination for people across the state, who could arrive by bus or railway. “I want minimal housing,” she added. He also pointed out that the project would serve as an incentive for overdue roadway adjustments, adding sidewalks and fixing the Alumni Road intersection. “It’s time we bring a conclusion to some of these longstanding issues,” he said. The next step is for the draft to be fleshed out by town staff. “Since this is a new concept to Newington, a lot of effort and detail will need to be added to each item in the draft outline,” Lane said this week. Councilors will have the opportunity to review each addition and eventually the public will also be asked to provide input, she added. When the regulations are complete they will be handed off to TPZ for review and approval - the same process any new applications follow.